In a society where images of vampires are romanticized and have become the fodder for tween daydreams as well as the storyline of movies, television series, and countless novels, Elizabeth Kostova has written a refreshing and brilliant novel on one of the oldest and best known vampires ? Dracula. The Historian is a deep and intricate book about the unfortunate luck of a group of scholars that fall into a search for the still living Vlad Tepes. The story spans over fifty years and three generations. It is the story of Professor Rossi, Paul, Helen, and the unnamed daughter of Paul who tells the story. Paul is a graduate student working feverishly on his dissertation on Dutch merchants when he finds an odd book on his desk at the library. It is an ancient book that has no text and a wood cut imprint of an intricate dragon in the middle. He takes this odd book to his advisor, Professor Rossi. This is where the mystery begins? Professor Rossi confides to Paul that he has a nearly identical book he found in an eerily similar way more than twenty years earlier. His quest to figure out more about the book and the legend of Dracula was a journey marked by death and brushes with supernatural horrors. Rossi was confident of one thing ? Dracula was alive and the books were somehow a way to discovering the location of his tomb. After making this confession, Rossi gives to Paul a series of letters that he wrote while searching for answers. He disappears that night under suspicious circumstances and Paul becomes obsessed with finding him. The story is told mainly through letters written by Rossi and Paul that are read by Paul's daughter as she begins her own adventure. 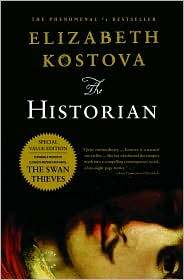 The Historian that Kostova writes about is Dracula ? a man obsessed with books and learning. The story she weaves is a clever take on an old character but she manages to refresh the story and give it a new life. The reader feels her love and appreciation of old books, scholarly pursuits, and travel. Some of the narrative is a bit over-written and the level of detail that goes into describing some of the lesser important aspects can be a bit much. However, the main characters are well-developed relative to the story but the lesser characters are diluted and interchangeable at times. The ending wasn't as satisfying as I would have liked. I think the author was trying to leave the reader with that sense of intrigue and wonder, but it fell short for me. There appeared to be two endings to the story and if Kostova had stopped with the first finale I would have been content, but the adding of a second ending diluted the power of the first. If you appreciate a good vampire story wrapped in European history and the beauty of the 1950s then you will adore this book as much as I did. I LOVED The Historian, too! But don’t be fooled into thinking the novel she wrote after The Historian is good. It’s called The Swan Thieves and it’s so horrible. Two of us reviewed it here so you can see we both hated it. Don’t waste your time on that one, but I’m glad you also liked The Historian! I need to read this one. I can’t believe I didn’t think of it to read for Halloween! I’ve never read the original Dracula–it doesn’t much appeal to me. The Historian, though, looks good. I’ve never read Stoker’s novel either, but it is definitely only my list of “someday”. I just cracked open Frankenstein for a good Halloween read. There is just something awesome about a new twist on an old story… I once read a short story that portrayed Snow White as a vampire and her “evil” step-mother as the person that saved the king from her slowly killing him – it was brilliant!